The gift card market is still growing. It’s estimated that 93% of consumers have either given or received a gift card in the last year, and gift cards are now among the most requested item on the wishlists of both, young and old. Retailers love selling gift cards, and consumers love buying them. But given the expansive size of the gift card market and the huge variety of different gift cards to choose from, it can be very difficult to figure out what kind of gift card is right for a friend, family member, or a loved one. There are a lot of factors to consider. Should I buy a digital gift card? Can I buy one that’s redeemable online and in person? What kind of stores sell the best gift cards? Will my gift card expire? You’ve got questions, and we’ve got answers. In this article, we’re going to walk you through 7 simple steps that will guarantee that you can pick out the perfect gift card for a family member, a loved one, or a friend – no matter the occasion. So read on, and learn how to navigate the complicated world of gift cards. The first step to buying a great gift card is to think about who you’re buying the gift card for. You wouldn’t buy your grandma the same gift as you would buy your nephew – so why would you buy the same gift card for both people? Despite their reputation, gift cards are far from a “one-size-fits-all” present. Each gift card is different, and choosing the wrong one can mean that your gift goes underappreciated – or is even ignored. Here are some quick tips to get you thinking about your intended gift recipient – and help you understand what kind of gift card they may like. What stores do they like? This is a simple way to help you think about some likely retailers where you may want to purchase a gift card. Think about the hobbies of your gift card recipient. Are they into video games? A gift card to GameStop or Best Buy might be a good idea. Are they into home improvement? How about Lowe’s?Choosing a gift card that is useful to the recipient is hugely important, so thinking about their hobbies, preferred stores, and other information is a great way to help you choose the right card. How old are they? Older people tend to not like gift cards as much – though they’re still great gifts. However, younger folks prefer gift cards to almost any other gift. This is not to say that you shouldn’t buy a gift card for an older person, but a younger recipient will likely be more appreciative of a gift card. Do they prefer online shopping? Some people don’t enjoy the experience of shopping at brick-and-mortar stores, and prefer online shopping. If your recipient prefers online shopping, consider getting them a gift card to Amazon – or a retailer that accepts online orders, such as Target or Walmart. Asking yourself these questions is a very helpful way to quickly get an idea of the perfect gift card to buy someone. So think them over, and then get ready for step 2. Picking the right store is crucial to giving a gift card. Picking a store that the recipient likes shows that you care – and that you thought hard about your gift before picking it out. You should also think about appropriateness when buying a gift card. You may know that your coworker Nancy likes Victoria’s Secret, for example – but if you draw her name in the office gift exchange, you shouldn’t buy her a Victoria’s Secret gift card. That would be impolite and inappropriate. That’s a bit of an extreme example, but it’s still something to think about, especially if you’ll be giving the gift card in a public setting. The same goes for younger kids – make sure that your gift card is age-appropriate, if the recipient is young, and has parental approval. There are cases where you won’t know where you should purchase a gift card – maybe you’re buying a gift card for a coworker, a teacher, or somebody else who you don’t know that much about. That’s totally fine! The best rule of thumb for dealing with these situations is to go general. While picking a gift card to a specific store is a great way to show somebody you care, it’s not going to be the right decision if you’re not sure where you should shop. Buying a general gift card to a store that has a huge variety of projects is the best way to deal with this situation. Online merchants like Amazon and big-box stores like Target, Wal-Mart, and others have gigantic varieties of products for sale – and if you give somebody a gift card to one of these retailers, they’re sure to be able to get something they need, and appreciate the gift. Surprisingly, this is a factor that most people don’t really think about. Some folks will put a set amount on any gift card they buy – $25, for example, and then be on their way. Now, this isn’t exactly wrong, per se, but it’s a good idea to think about what balance is appropriate for each specific kind of gift card. For example – if you give somebody a $25 gift card to a retailer like Target, great! They can probably buy quite a few items with just that small amount of money! However, $25 to a big-box electronics store like Best Buy would barely even buy you one item, and the gift card recipient would likely have to pay with both their gift card and some supplementary cash – which makes the gift card feel less special. Here’s another example. 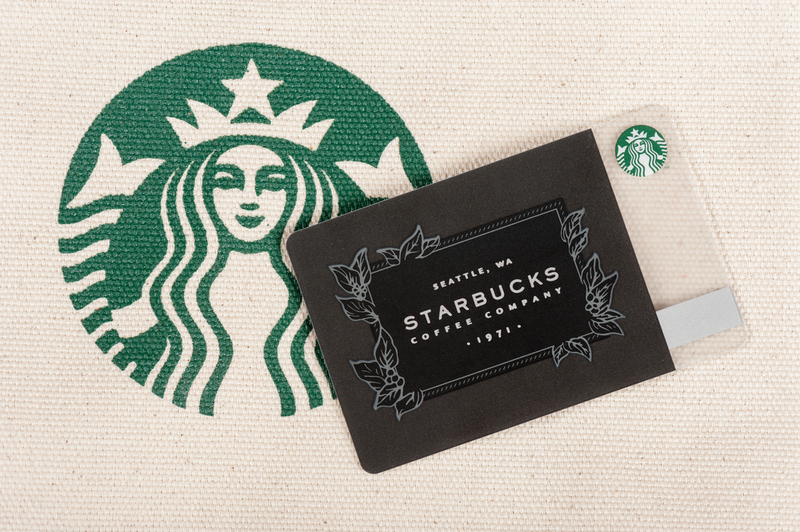 A $10 Starbucks gift card would be a great gift for a teacher or a coworker – that will buy them almost 5 coffees! But a $10 gift card to their favorite restaurant likely won’t even cover the price of their entree. You should also consider the occasion for which you’re buying the gift card. If you’re giving a gift card to a loved one on an anniversary or an important day like a graduation, for example, they may expect a higher monetary value. So take some time to think through the appropriate balance for each gift card. A little bit of thought goes a long way when it comes to choosing the perfect gift card. Since the CARD act of 2009, there are fewer restrictions allowed to be placed on gift cards – gift cards can’t expire for up to 5 years, and restrictions are placed on fees collected on inactive gift cards. However, you should still check each gift card you buy for their terms and conditions. Some will level fees after 12 months of nonuse, or have other terms and conditions that are important to understand before purchasing them as a gift. You should also inform your gift card recipient of any applicable fees and regulations, and give them a copy of the receipt obtained after gift card purchase, as they may be able to use that receipt in case their gift card is defrauded, or if they lose their physical gift card. This is a great piece of advice. Everyone loves the opportunity to buy stuff online – and some retailers now offer gift cards that can be redeemed either in person, or applied to online accounts. These “omnichannel” gift cards provide great flexibility for recipients. For example, maybe you have a loved one who likes a particular store – but that store doesn’t have any locations near their home. You can purchase a gift card to that store that can be used online, and your loved one can then shop to their heart’s content online – without worrying about driving all the way to their favorite store. This is not mandatory, of course – many people still enjoy the experience of shopping in-person at a brick-and-mortar store, but gift cards are all about choice, and giving your gift card recipient the choice of shopping either online or in a retail store is a great way to add even more flexibility to your gift. In the past, you didn’t really have any other option beyond hand-delivering a gift card to the recipient, or sending it to them through the mail. However, as digital gift cards increase in popularity, you have more options – digital delivery is a popular choice, as you can send a gift card directly to a recipient’s email. Digital gift cards also have the advantage of being purchasable at any time – all you have to do is log into your computer and buy one online. This makes digital gift cards a great last-minute gift. However, some people still don’t like digital gift cards, especially older folks. Younger people tend to be much more accepting of digital gift cards, and tend to see them in the same way that they would see a physical gift card. Digital gift cards are also great if you’re sending a gift to someone far away – if you can’t make it to the graduation of a relative, for example. You can still quickly and easily send a gift, but not worry about sending a physical gift card. However, some people prefer physical gift cards. Somehow, they just feel a bit more “real”. So if you know that your recipient prefers a physical gift card and you’ll be able to hand-deliver it, going physical is a fantastic choice. In the end, it’s really up to you – both physical and digital gift cards have their advantages, and whichever way you decide to go, your recipient will surely appreciate your gift. Step 7 is to give your gift, and know that you’ve chosen the perfect gift card for your particular needs. You’ve done your research, you’ve found a great card, and you’ve loaded it up with the perfect balance for the recipient. All that’s left is to enjoy the experience of giving away your card. Got Gift Cards You Don’t Need? You Can Sell Them Instantly At EJ Gift Cards! If you have a gift card that you don’t need, don’t waste it by letting it sit around on your dresser or in your junk drawer collecting dust. At EJ Gift Cards, you can sell your unwanted gift cards instantly and get paid through PayPal, and turn your useless balance into cold hard cash. EJ Gift Cards is an industry leader when it comes to buying unwanted gift cards. We offer hassle free payment via PayPal, a simple, step-by-step buying process that’s totally non-binding, and we accept hundreds of different cards and offer competitive rates on each and every one – so you’ll be able to get rid of just about any gift card that you don’t need. In addition, we have a dedicated, comprehensive customer support team, and we’re always willing to help you walk through our process, understand our terms and conditions, and address any concerns you may have about our service. We’re totally dedicated to providing you with a simple, intuitive gift card selling experience. So don’t wait. Turn your useless gift cards into cash with EJ Gift Cards today. You’ve got nothing to lose – and plenty of money to gain.